In 2014, Parks Canada, together with support from key partners including Fisheries and Oceans Canada via its Canadian Hydrographic Service and Canadian Coast Guard, solved a key chapter of a longstanding maritime mystery when they discovered one of Sir John Franklin’s ships, HMS Erebus, in the western waters of the Canadian Arctic. HMS Erebus, along with sister ship HMS Terror, entered the Arctic in 1845 with 128 officers and crew, along with the steadfast belief that they would forge the final link in the Northwest Passage. Instead, both refitted warships became entrapped in the ice near King William Island and tragedies trailed to claim each man. Nearly 166 years later key clues were found, followed by astonishing images captured through modern surveying technologies of a nearly intact Erebus resting on the seabed in eastern Queen Maud Gulf. 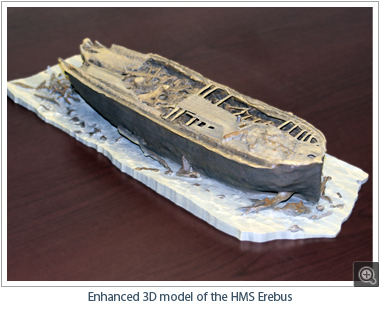 In 2015, Fisheries and Oceans Canada’s Canadian Hydrographic Service partnered with Canadian geospatial software company CARIS and geomatics technology innovation support centre TECTERRA, to print the first 3D model of HMS Erebus. The model was produced using multibeam data collected by the Canadian Hydrographic Service and exported through CARIS software by running a gridding algorithm on the sonar point cloud to create a continuous surface required by the 3D printer. The stunning reproductions were printed in-house by TECTERRA in Calgary and were publicly unveiled on April 1, 2015. In 2016, CARIS again worked closely with the Canadian Hydrographic Service to further enhance the Erebus model by developing and experimenting with a continuous surface (mesh) algorithm. Moving from the gridded surface to a mesh surface would preserve the tapered nature of the ship’s hull during the export to the printer. Data was further refined and printed by Think2Thing of Toronto, Ontario. With the added fine details captured in the mesh, print materials were also revised from a coloured sandstone to a more durable laser sintered nylon. As a final step in the process, the newly printed 16” nylon models were hand painted by artist Marianne Collins of Ontario to add the colour dimension, based on photographs collected underwater by Parks Canada’s divers. The completed high precision models were proudly displayed by Director General Denis Hains of the Canadian Hydrographic Service during the 2016 Canadian Hydrographic Conference in Halifax. – Denis Hains, Hydrographer General of Canada and Director General of the Canadian Hydrographic Service.